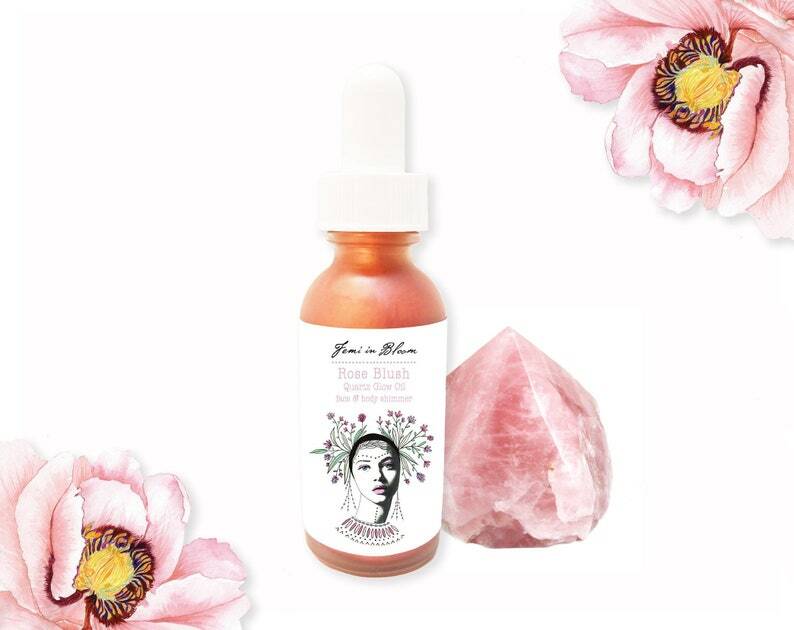 Smoother yourself in a girls best friend of rose quartz crystal shimmer oil! 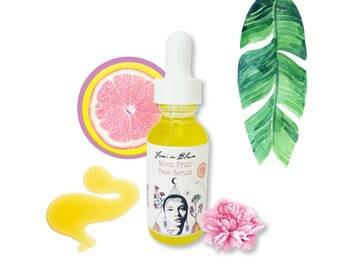 A botanical infused sun loving quartz body oil that protects, softens, nourishes, and shimmers the skin with a sensual highlighting blushed rosy illuminating glow. Filled with natures pure therapeutic Essential Oils such as Carrot Seed, Helichrysum, and Lavender that are safe and beneficial to use in the sun. 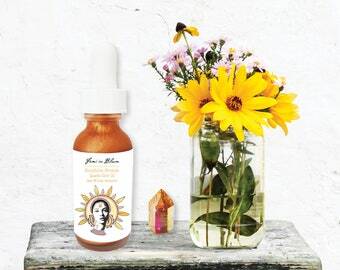 Carrot seed oil acts as a beautifying natural tanning enhancer. 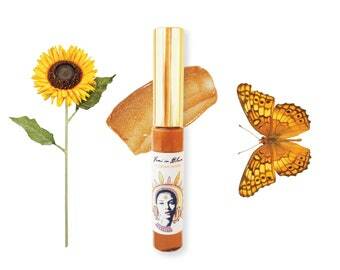 A mastered pure sun dry oil combo that helps nourish, tone, tighten, revitalize, and rejuvenate the skin. Designed to better protect the skin against damaging effects of UVR than chemical made sunscreens. 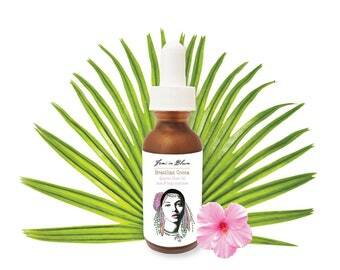 This body oil may also be used with any natural topical sunscreen. Enriched with Antioxidants, Omegas 3,6+9, Vitamins A,C,E,+ K, B-complex. Rich in protein plus minerals. 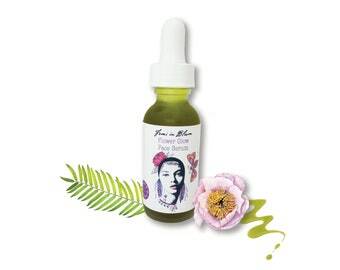 - Dry body oil that moisturizes and absorbs quickly into the skin. Shake up first. Apply lightly onto your face or body using a circular motion. Easy application with dropper, no mess. Wash hands after use. Safe to use in the sun. You may also apply your favorite natural sunscreen as needed. 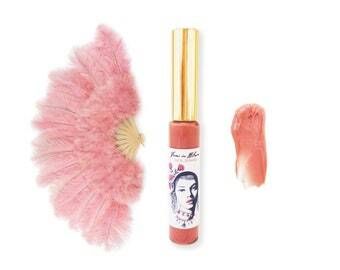 Apricot kernel oil is quickly absorbed into the skin and does not keep the skin oily after it's applied. 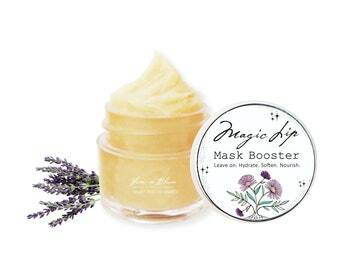 Ideal for sensitive skin, as it prevents premature aging, penetrates the skin easily and provides a softening effect. It is an amazing moisturizer for all skin types. Apricot kernels themselves are quite healthy and are being researched for a number of health conditions now. So its a perfect oil to use in the sun for supporting healthy skin! Packed with natural healing properties. Carrot seed oil is derived from the dried seeds of the wild carrot plant. 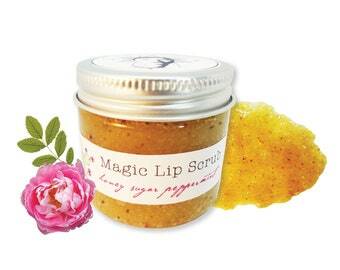 Helps nourish, tighten, and rejuvenate the skin. Improves skin tone, elasticity, and overall skin health. Natural tanning enhancer. Ancient beauty sacred oil. Costly and scarcely available. Highly calming, soothing, and extremely healing. Helps stimulate the growth of new tissue. 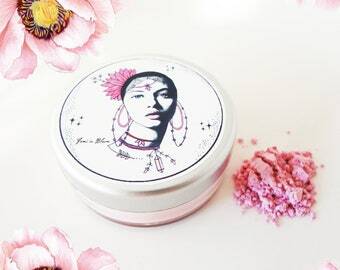 Perfect for helping the skin appear more firm, youthful, and vibrant. 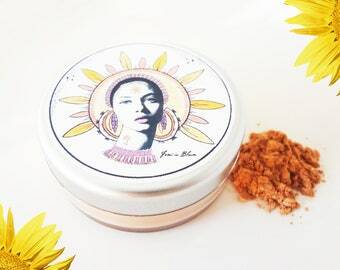 It also helps protect the skin within sun exposure. Safflower oil contains lubricant properties that prompt the skin to retain water and moisture. The high content of linoleic acid in safflower oil makes it ideal for boosting the quality and appearance of your skin. 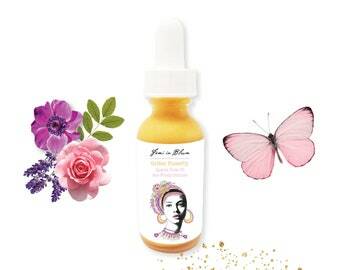 Argan helps fight fine lines and wrinkles, repair imperfections, minimize scars and stretch marks, restore texture, elasticity and tone, and reduce inflammation. 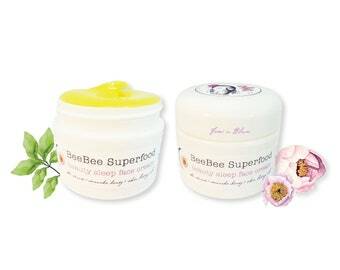 Lightweight and easily absorbed into the skin. Amazing absorption and moisturizing qualities, sealing in moisture and creating an effective barrier to external elements. Jojoba contains almost all of the vitamins and minerals essential for healthy skin and hair like vitamin E, B-complex, copper, zinc, selenium, iodine, and chromium. Prunus Armeniaca (Apricot) Kernel Oil, Helianthus annuus (Sunflower) Seed Oil, Carthamus tinctorius (Safflower) Seed Oil, Moroccan Argan Oil, Simmondsia chinensis (Jojoba) Seed Oil, Vitis vinifera (Grape) Oil, Rosa Rubignosa (Rosehip) Seed Oil, Cocoa, White Tea Extract, Carrot Seed Essential Oil, Lavandula angustifolia (Lavender) Essential Oil, Matricaria chamomilla (Chamomile) Essential Oil, Helichrysum italicum Essential Oil, Sunflower Vitamin E, Golden Bronze Shimmer Mica Minerals. 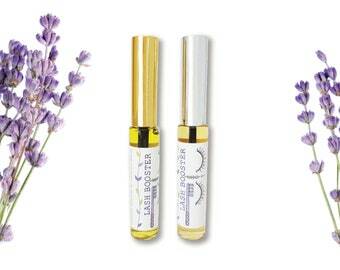 Pure Therapeutic Grade Essential Oils. If you have an allergy to any of the ingredients please do not use. You can test the product on your wrist first if you are unsure. If you have any type of reaction contact your Doctor. Pregnant: Message in with your order for me to remove the carrot seed oil for you. 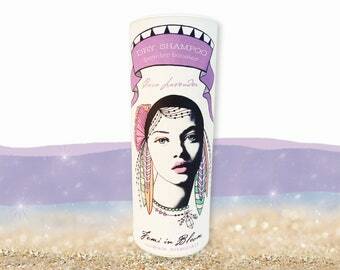 "I'm loving your shimmer oil at the beach and also for going out. I applied some on my face too for a little shimmer glow. The bronze glow looks pretty on my pale skin. Smells like flowers, excellent buy." "I love that you use carrot seed oil! 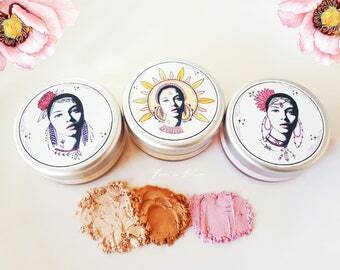 My skin feels better in the sun now and I'm happy to be glowing with natural shimmer any day!" "Double loving the ingredients. It absorbs quickly. My skin is glowing and feels super moisturized and softer. I wanted something organic with shimmer and this worked out perfectly."